Audi has revealed the facelifted Audi Q3 and go-faster RS Q3 ahead of its arrival in spring 2015. Boasting a new engine range, as well as a couple of aesthetic tweaks, the new Q3 promises improvements in both economy and power. The biggest change to the Q3’s engine line-up is the new 1.4-litre TFSI CoD (Cylinder on Demand) petrol engine also seen in the A1 and A3, which, in a bid to save fuel, shuts off two of the four cylinders when they are not needed. Available with front-wheel-drive Q3s, the CoD engine improves combined fuel economy to 50.4mpg and CO2 emissions to 128g/km – an improvement of 2.5mpg and 9g over the 1.4 FSI unit it replaces. However, fitting the S-Tronic automatic gearbox will efficiency fall to 47.9mpg while emissions will rise to 136g/km. It packs a punch though, with 148bhp helping the automatic Q3 achieve the sprint to 62mph in 8.9 seconds. Rounding off the Q3’s petrol engines is the same 2.0-litre power plant seen in the current Q3, albeit with a 10bhp power hike. Despite now serving up 178bhp and being offered only with front-wheel drive, this engine is more economical than before, reducing fuel consumption by 6.1mpg and reducing emissions by 27g/km to provide headline figures of 42.8mpg and 152g/km. Diesel power is catered for by the two 2.0-litre TDI engines, offering customers the choice of 148bhp or 182bhp and fuel economy ranging from 53.3mpg to 61.4mpg. The most economical is the 148bhp engine with front-wheel-drive, which emits CO2 at a rate of 119g/km, but upgrading to the Quattro four-wheel-drive system will increase consumption by 4.9mpg and emissions by 12g/km. At the top of the range, the RS Q3 will get a 30bhp power upgrade. Now equipped with a 335bhp, five-cylinder petrol engine, the compact SUV will dash to 62mph in 4.8 seconds (down from 5.2 seconds for the outgoing model) and return 32.8mpg. 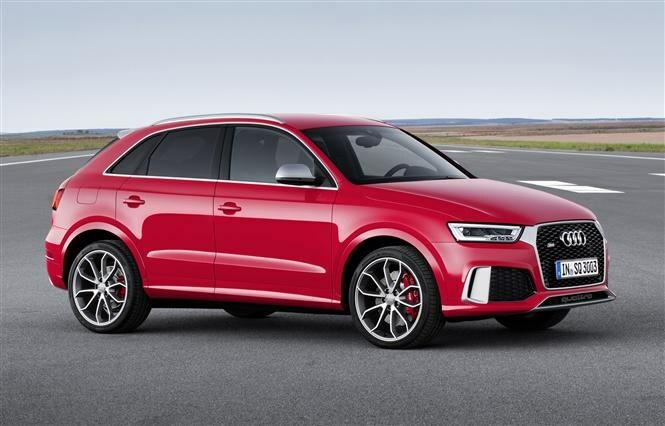 Externally, the Q3 has been updated with the new 3D-effect ‘singleframe’ grille which is becoming common across the brand’s models, as well as revised bumpers and new alloy wheels. Entry-level SE versions get xenon bulbs and LED daytime running lights as standard, while S Line and S Line Plus models come with LED headlights and ‘scrolling’ indicators as standard. RS Q3s, meanwhile, get a sports exhaust system, 20-inch wheels, RS bumpers and RS-specific black detailing, such as the honeycomb front grille. All variants also include the Audi Drive Select system (previously a cost option), dual-zone climate control, a Concert audio system with a 6.5-inch retractable touchscreen and light and rain sensors. Navigation preparation is also standard, allowing customers to retrospectively fit sat nav by simply buying the relevant SD card. Moving up to S Line Plus trim will provide perforated leather and Alcantara upholstery, cruise control and the Audi Parking System Plus, which comes with visual and acoustic guidance. RS models, meanwhile, benefit from sports seats with full leather and contrast stitching and a lap timer. The Q3 will go on sale this month with a starting price of £25,340. The RS Q3 will follow in January, although pricing and specifications are not yet confirmed.